The Digital Brighton & Hove project provides innovative solutions and services for digitally excluded people across the city. Through cross-sector partnership work, they’re building a network of trained Digital Champions in local communities to support service users, staff and volunteers with their digital transformation journeys. Digital Brighton & Hove is funded by the Big Lottery Fund (through the One Digital programme) and Brighton & Hove City Council. Those older people most affected by digital exclusion are those with the lowest levels of wealth, health and education. As essential services continue to move online, they are at risk of being left behind. As well as providing an Internet Essentials course for older people in association with Age UK (now reaching its tenth edition), our Digital Brighton & Hove project has been working closely with Brighton & Hove City Council’s Seniors Housing Department, providing digital skills support to residents through digital gadget drop-ins run by our Digital Champions. For the past two years, the project has delivered over 200 digital gadget drop-ins across 23 sheltered housing schemes across the city. Our Digital Champions, equipped with their tablets and personal WiFi hotspots, provide personalised digital support within the communal spaces of the schemes, most of which do not have connectivity. These digital gadget drop-ins are open to all and offer flexible one-to-one support enabling the end learner to get to grips with technology and the internet at their own pace, all in a flexible and informal learning environment. The sessions are based on helping older people find a hook which will help them see the value of being online and as a result, become more confident and engaged with the internet. Sylvie is 88 years old and has lived in a Seniors Housing scheme in Hollingdean, Brighton, for a number of years. A keen IT learner and crochet enthusiast, she has been making the most of the monthly digital gadget drop-ins run by our community Digital Champion, Josie Jeffery, for the past six months. Sylvie used to attend knitting craft sessions in her local community centre until her health prevented her from walking up the hill. She was then thrilled to discover she could learn more about knitting by watching online videos. The project has also played an active role in the Citywide Connect Partnership, that brings together different organisations from across sectors to tackle social isolation in Brighton & Hove. Our input has focused on presenting digital as a simple way of keeping in touch and connecting with relatives and friends for those who have become more isolated for a number of reasons. Sylvie’s own situation is a good example of how digital communications have helped her stay better connected with family, her health issues restricting her from going out and preventing her from seeing her grandchildren as much as she would like. With Josie’s support, Sylvie has learnt how to make video calls and send direct messages with her Grandson using Skype. 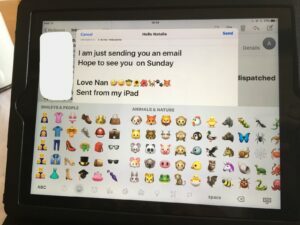 She has also learned how to compose emails and include emojis while writing to her granddaughter. Sylvia commented: “My granddaughter and friend replied to the email I sent and they enjoyed the smiley faces I included. Sylvie is looking forward to the next digital gadget drop-in so she can learn how to attach photographs to emails by using her iPad camera and share her favourite knitting images with her friends and family! At Citizens Online, we think that providing digital support to older people like Sylvie should happen in an embedded way, on a day-to-day basis rather than say, once a month. The Digital Brighton & Hove project will next be working with the Seniors Housing Management team to provide training for their staff so they can become Digital Champions and soon be in a position, with the support from our Digital Champions, to provide more regular one-to-one digital support. Through a combination of professional, embedded and volunteer Digital Champions, there is no doubt that residents like Sylvie can learn more and quicker in a comfortable and personalised learning environment. Soon enough, Sylvie could even have the confidence to become a Digital Champion for her friends and neighbours, and start sharing her new digital skills with confidence!